Acasta Midshipman/Lieutenant under Capt. Kerr, c. 1814-15, aged approx. 19. Edward Brenton Stewart, born 7 March, 1795, is son of the late Hon. J. Stewart, Judge of the Supreme Court of Halifax, Nova Scotia. This officer entered the Navy, 17 Oct. 1807, as Fst.-cl. Vol., on board the Leopard 50, Capt. Salusbury Pryoe Humphreys, bearing the flag of Hon. Geo. Cranfield Berkeley on the coast of North America ; where he continued to serve, with occasional intervals, in the Swiftsure 74, flag-ship of Sir John Borlase Warren, Spartan 38, Capt. Edw. Pelham Brenton, Shannon 38, Capt. Philip Bowes Vere Broke, Asia 74 and Tonnant 80, bearing each the flag of Hon. Sir Alex. Cochrane, and Acasta 40, Capt. Alex. Robt. Kerr, until Aug. 1815. 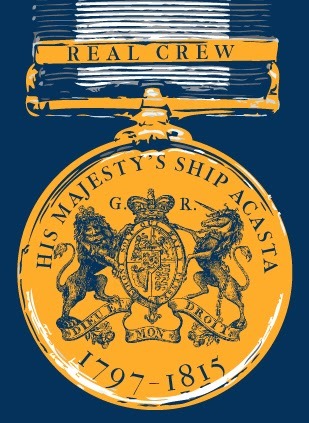 While employed in the latter ship he received a Lieutenant's commission dated 1 Sept. 1814.